1. Place dried mushrooms in a medium bowl and pour hot tap water over them and submerge them for 30 minutes, or until soft. You may cut them when soft but it is not necesary. 2. Rinse and drain well the sauerkraut and set aside. 3. Wash mushrooms and slice them. You may leave the small ones whole. 4. Fry the bacon and sausage in 2 tablespoons vegetable oil over medium-high heat for 5 minutes then add pork and fry for next 7-10 minutes until golden brown. 5. 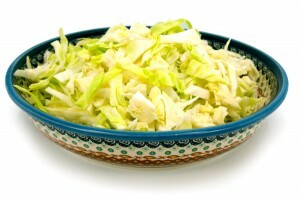 In a large pot sauté the onion and fresh cabbage in 2 tablespoons of vegetable oil. 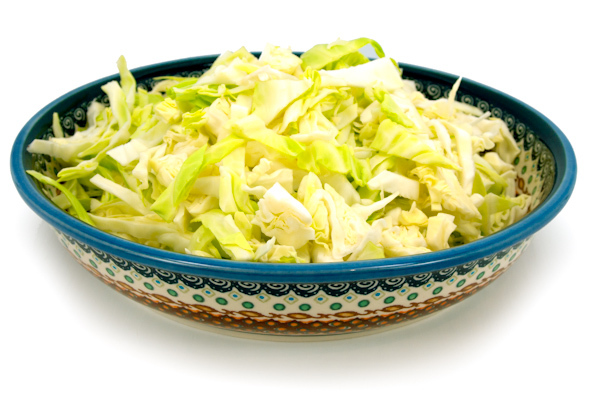 When cabbage collapses by half, add sauerkraut, fried meat, bacon, sausage, bay leafs, salt, black pepper, soaked dried mushrooms and their soaking liquid (without the sediment from the bottom of the bowl), and 2 cups of beef stock. Stir well and bring to a boil over medium heat. Lower heat to low and simmer covered for 1 hour, stirring occasionally and adding liquid as needed to prevent burning. 6. Put tomatoes to a bowl and pur boilling water over them. Let tem stay in the hot water for about 10 seconds turning them. Drain the water and now you can easly peel the skin. Dice tomatoes into 1/2 inch cubes. 7. 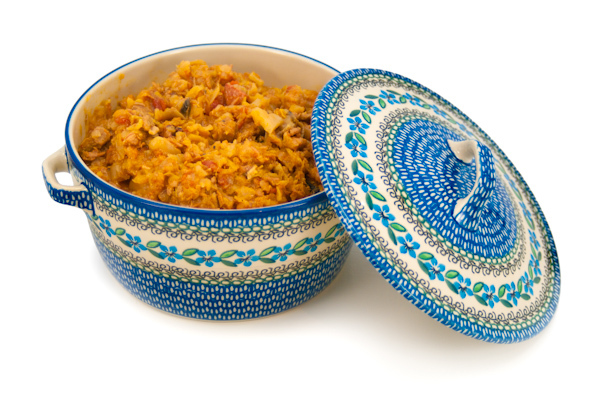 Add tomato paste and diced tomatoes to the simmerring bigos and cover the pot. Cook gently for next hour. Again, stir occasionally and add liquid as needed to prevent burning. Longer you cook it the better the bigos tastes. It tastes even better the next day or two. 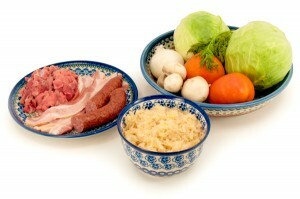 So, do not worry about the big pot of bigos. This entry was posted in Cooking with your Polish Pottery and tagged Polish recipes on October 29, 2011 by Monika.